Henry Sotheran Ltd are now on Pinterest - click on the link below to follow us and start pinning! Our Pinterest boards highlight a diverse selection of our most visually exciting stock, such as this fantastic prop from the film Harry Potter and the Half-Blood Prince. 4to. An original studio prop made for, and used in, Warner Brothers film "Harry Potter and the Half-Blood Prince"; original beautifully printed pictorial card covers, stapled to spine, lavishly embossed in metallic foil, incorporating, across upper and lower covers, a pair of "Spectrespecs" with inset red and blue cellophane windows and perforations, designed to be popped out and worn, with inner covers printed in detail with Classified Advertisements; pp. 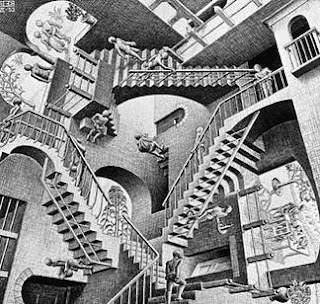 , internally finely screen-printed in colours with a gathering of 6 different pages of wittily captioned articles and illustrations, duplicated once, with repeating text in Latin; a fine and magical item. Sole edition. A "hero" prop which was used on set by the cast, notably by the character of Luna Xenophilius Lovegood on the train journey to Hogwarts. In the film adaptation of Harry Potter and the Half-Blood Prince Luna rescues Harry from Draco Malfoy's compartment on the Hogwarts' Express using her Spectrespecs, which allow her to see wrackspurts around Harry's head when he is hidden beneath his invisibility cloak. 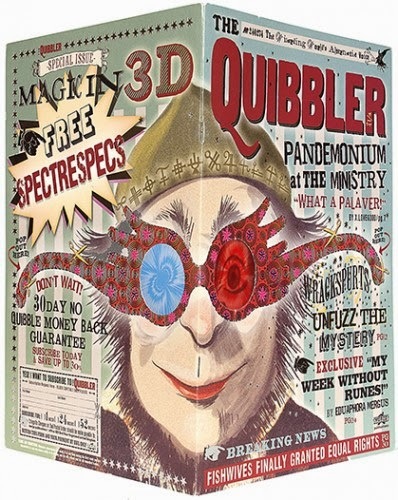 Spectrespecs were distributed free with this special copy of The Quibbler. According to Luna the glasses were designed to make wrackspurts, which are "invisible creatures that float into one's ears, causing them to go fuzzy", visible to the wizarding eye. Dry January? The finish line is in sight!